Amaranth | Infonet Biovision Home. Weevil pupa in amaranth stem. Weevil larva feeding in amaranth stem. Adult weevil in amaranth stem. Adult weevils are 11.7 mm long. Females are slightly larger than males. Amaranth stem with cankers due to internal feeding by weevil larvae. Map showing the Geographical Distribution of Amaranth Crop in Africa. Source www.cabi.org (2014). Updated 28 November 2018. 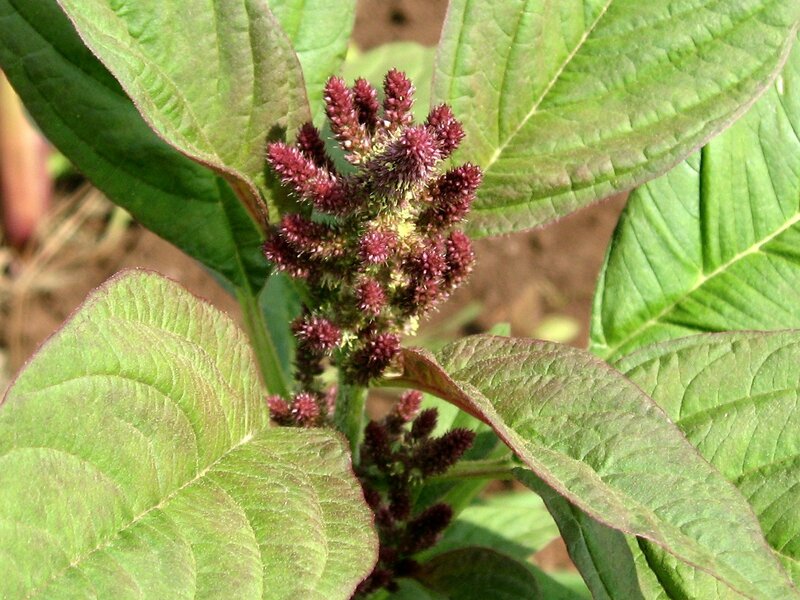 While originating from tropical America amaranth is now very widely distributed throughout the tropics. 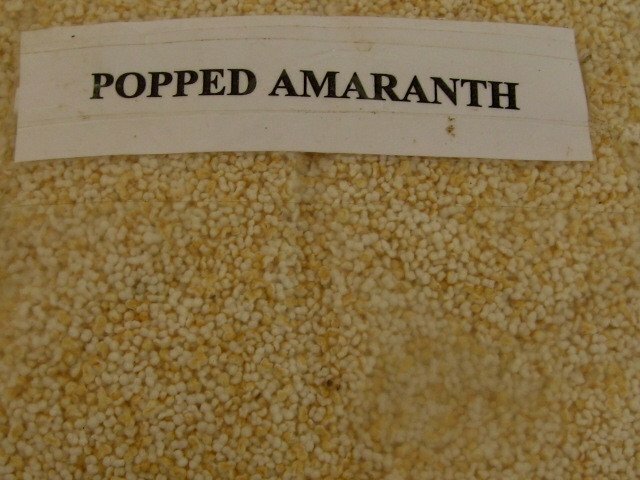 Amaranth is an herbaceous annual belonging to the family Amaranthaceae with green or red leaves and branched flower stalks (heads) bearing small seeds, variable in colour from cream to gold and pink to shiny black. 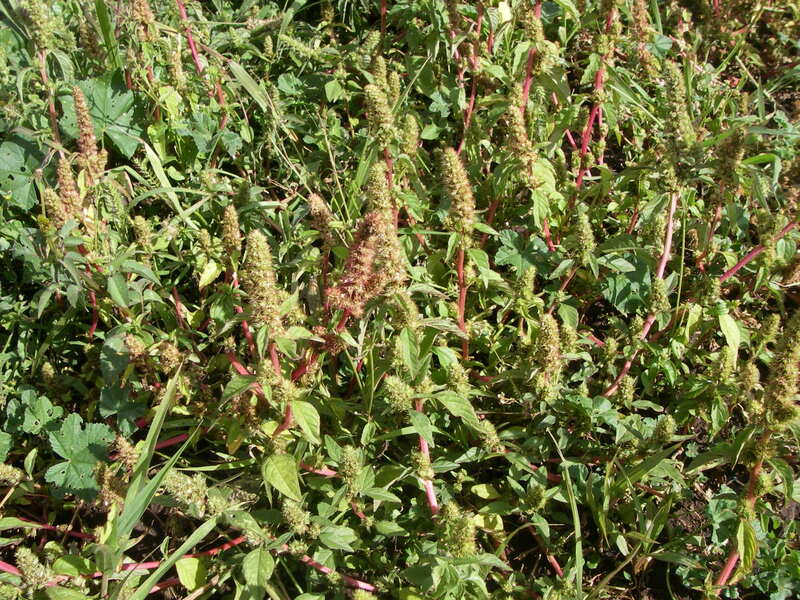 There are about 60 species of Amaranthus, however, only a limited number are of the cultivated types, while most are considered weedy species and hence rarely preserved. 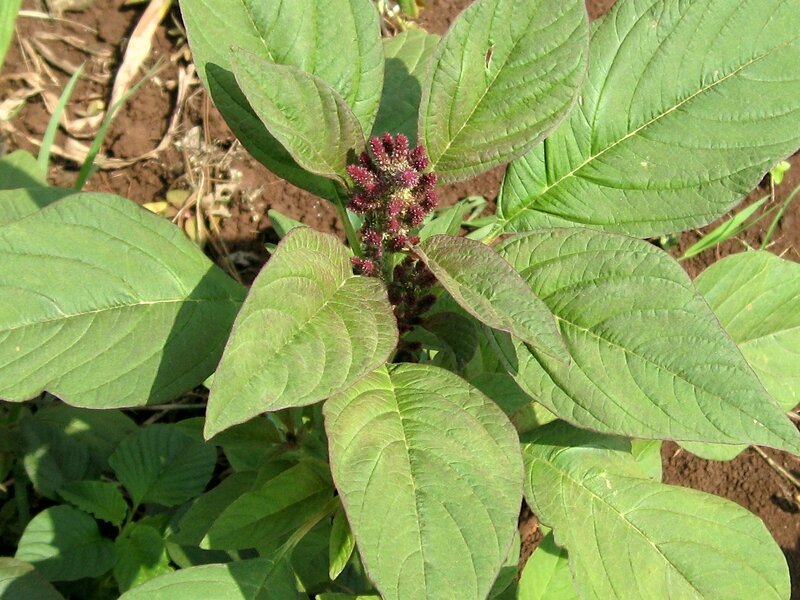 Many amaranth species are collected from the wild for subsistence, while only few are cultivated or occur as protected weeds in backyards and home gardens (Stallknecht and Schulz-Schaeffer, 1993; Ouma ; Biovision TTU, ICIPE: Keller, 2004). Amaranth can be used as a high-protein grain or as a leafy vegetable. The seeds are eaten as a cereal grain. They are ground into flour, popped like popcorn or cooked into porridge. 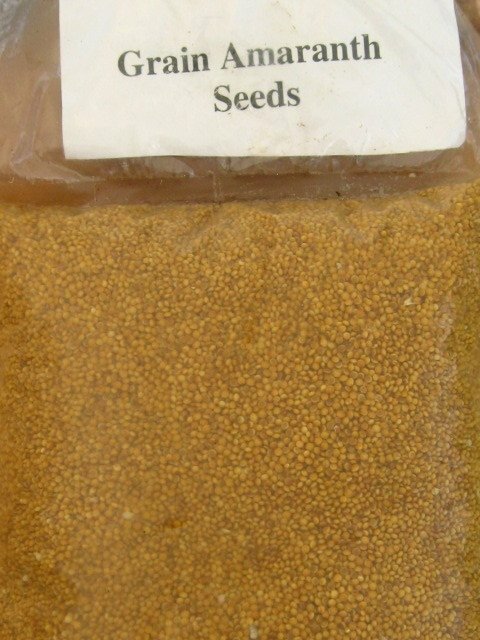 The seeds can be germinated into nutritious sprouts (GFU for Underutilized Species). The leaves are cooked alone or combined with other local vegetables such as spider plant and pumpkins. The leaves are rich in calcium, iron and vitamins A, B and C, but fairly low in carbohydrates (Ouma, Biovision TTU, ICIPE). There is no distinct separation between the vegetable and grain type since the leaves of young grain type plants can be eaten as greens (Stallknecht and Schulz-Schaeffer, 1993). 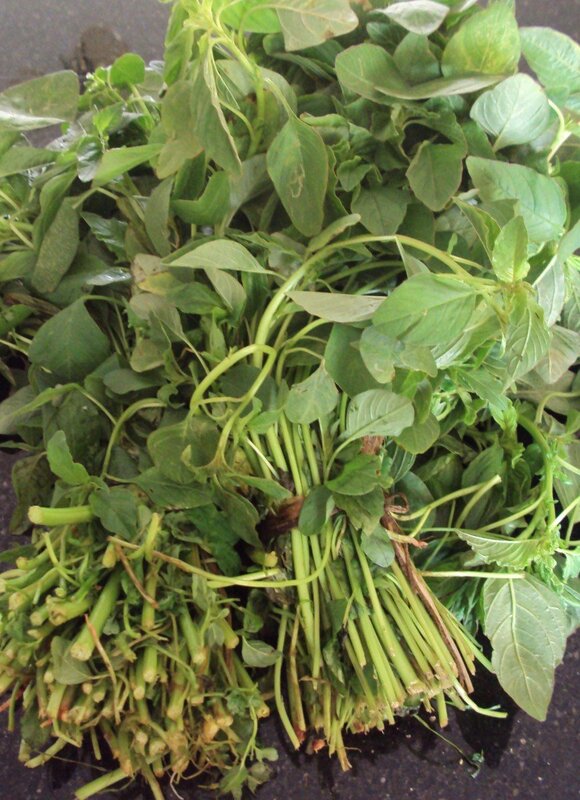 Of all the indigenous tropical leafy vegetables, amaranth has the largest number of species and varieties. The choice of variety varies widely among regions and is dictated largely by the species available. Regardless of species, the choice of variety is influenced by individual preference for leaf colour and taste. Some of the most common commercial amaranths are selections of A. tricolor which come in various leaf colours such as white (light green), dark green, red, purple and variegated. To identify which varieties are best adapted to your location, compare during different growing seasons the yield potential of currently grown varieties with that of other available varieties (AVRDC 2011). Some varieties available in Kenya are KK Livokoyi, KK Mrambi, KAT Gold and Terere smart (KEPHIS, 2018). Some varieties available in Kenya are KK Livokoyi, KK Mrambi, KAT Gold and Terere smart (KEPHIS, 2018). * Percent Daily Values (DV) are based on a 2000 calorie diet. Your daily values may be higher or lower, depending on your calorie needs. Amaranth grows from sea level to 2400 m altitude. The different species may suit different altitudes. Normally the hotter it is the better it grows and it generally thrives within a temperature range of 22-30degC. A minimum temperature of 15-17degC is needed for seed germination. 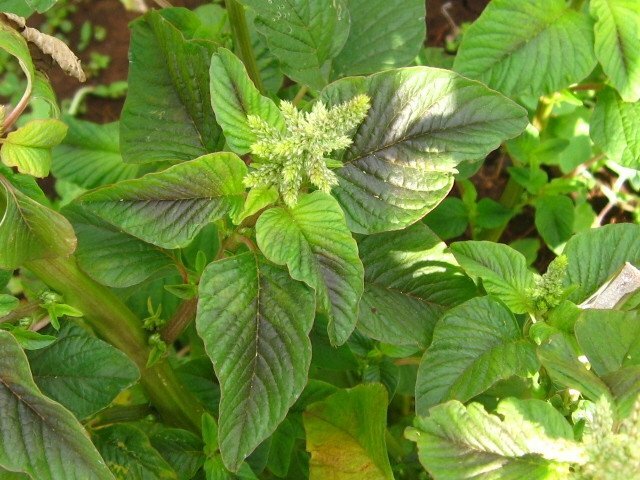 Amaranth is grown during both wet and dry seasons, though irrigation is normally required for dry season crops since the rate of transpiration by the leaves is fairly high. Frequent applications of water are required, related to the stage of growth of the crop and the moisture-retaining capacity of the soil. It can however tolerate periods of drought after the plant has become established. It is adapted to low to medium humidity (Bruce French, EcoPort). Amaranth grows best in loam or silty-loam soils with good water-holding capacity, but it can grow on a wide range of soil types and soil moisture levels. Amaranth can tolerate a soil pH from 4.5 to 8. Amaranth requires thorough land preparation and a well-prepared bed for good growth. Prepare 20 cm high beds during the dry season and 30 cm during the wet season using a plough. The distance between centres of adjacent furrows should be about 150 cm with a 90 cm bed top. Amaranth is planted either by direct seeding or transplanting. The choice of planting method depends on availability of seed and labour and may also vary with the growing season. Direct seeding is appropriate when plenty of seed is available, labour is limited, and during the dry season when frequency of flooding is less. Transplanting is preferred when there is limited amount of seed, plenty of labour, and during the wet season when heavy rains and flooding are most likely to wash out seeds. Raising seedlings in a nursery and transplanting them to the field shorten the crop duration in the field, and secure a better and more uniform stand especially during the wet season. Seedlings are grown in a seedbed, pulled and bare-root transplanted. They can also be grown in divided trays, lifted with the root ball intact and transplanted. If seedlings are started in a raised soil bed, the soil should be partially sterilised by burning a 3-5 cm thick layer of rice straw or other dry organic matter on the bed. This also adds minor amounts of phosphorus (P) and potassium (K) to the soil, which helps in the establishment of the seedlings. Broadcast the seeds lightly in a seedbed and cover them with soil. The seeds should be one 1cm deep. Cover the seedbeds with an insect-proof net to protect seedlings from pests. Transplant in the late afternoon or on a cloudy day to minimise transplant shock. Dig holes 10 cm deep on the bed using recommended spacing for the chosen variety. Place each transplant in its hole and cover the roots with soil and lightly firm. Irrigate immediately after transplanting to establish good root-to-soil contact. First harvest is at a plant height of 30 cm, about 6 weeks after transplanting. Plants may be harvested at once or leaves and tender shoots maybe harvested several times. One single harvesting is adapted for short maturing and quick growing varieties such as A. tricolor. Whole plants are pulled from soil with roots, washed and tied in bundles. With multiple harvests, young leaves and tender shoots are picked at 2 to 3 week intervals. Eventually, the plants begin to flower and develop fewer leaves. Frequent harvesting of leaves and shoots delays the onset of flowering and thus prolongs the harvest period. Amaranth and other leafy vegetables have a large surface and loose water rapidly. To reduce water loss, harvest during the cooler time of day, such as early morning or late afternoon. 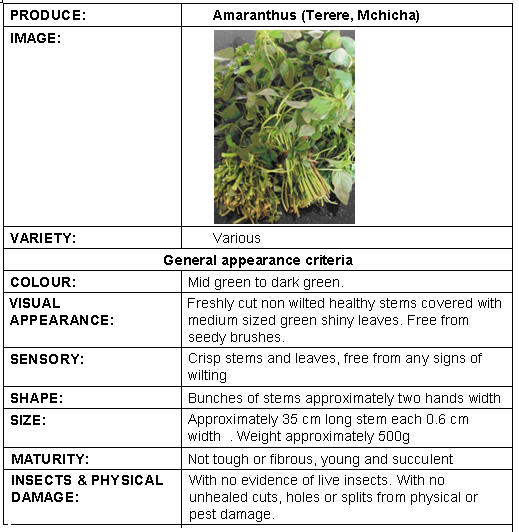 Amaranth is susceptible to damage by foliar insects such as leafminers, leafroller caterpillars, cutworms, aphids, flea beetles, and mites.An effective method of controlling insect pests is to cover the bed with a fine screen or nylon mesh netting (32-mesh or finer) (AVRDC, 2011). 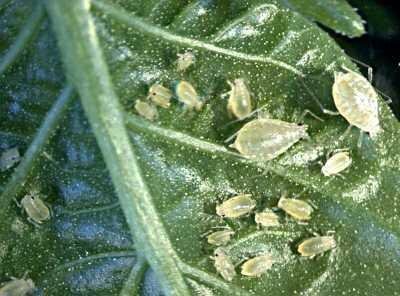 Aphids are a major pest, causing leaves to curl and become unattractive to customers. Aphids feed by sucking plant sap. Small aphid populations may be relatively harmless, but heavily infested plants usually have wrinkled leaves, stunted growth and deformed seeds. Plants, in particular young plants, may dry out and die under heavy aphid attack. 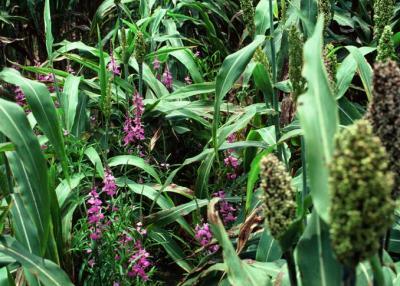 Heavy attack on older plants may cause crop loss by decreasing flower and seed production. Damage may also reduce seed viability. Whenever necessary spray only affected plants (spot spraying). Cutworms attack young seedlings. First instars are 7-12mm, fully grown caterpillars are 3.5-5 cm long. The caterpillar emerges from the soil at night, encircles the plant with its body and cut through the stem of young plants just above ground level. They may also damage the plants underground. Cutworm damage causes plants to wilt and die. Cutworm damage is usually minor and does not normally warrant control. However, in severe outbreaks a young crop may be destroyed. Monitor damage by counting damaged and freshly cut young plants. Monitor cutworm at dawn. Prepare field and remove weeds well ahead (10-14 days) of planting the crop in the field. Ploughing exposes caterpillars to predators and to desiccation by the sun. 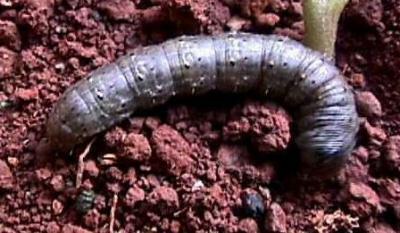 If the field is planted soon after land preparation, some cutworms may be alive and attack the new crop. Leafminers (Liriomyza spp.) are small flies, 1.3-1.6 mm in length. The maggot makes long, slender, white mines (tunnels) in leaves. Severely mined leaves may turn yellow and drop. Severely attacked seedlings are stunted and may eventually die. Control measures are necessary when attack is severe, especially on young plants. Hand pick and destroy mined leaves. Damage on leaf by leafminers (Liriomyza spp.) . Adult leafminers are 1.3-1.6 mm in length. 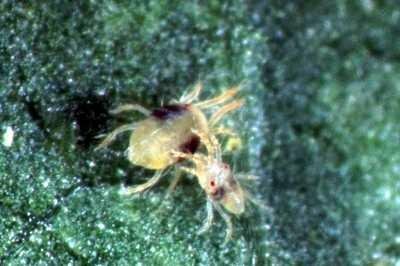 Spider mites feeding on plants may cause reduction in plant growth, flowering, and number of seeds. Damage is most severe when mites attack young plants. Mite damage may be particularly severe during the dry season. Avoid planting next to infested fields. Avoid frequent use of broad-spectrum pesticides, in particular pyrethroids; this may lead to spider mite outbreaks. Several species of weevils feed on amaranth. 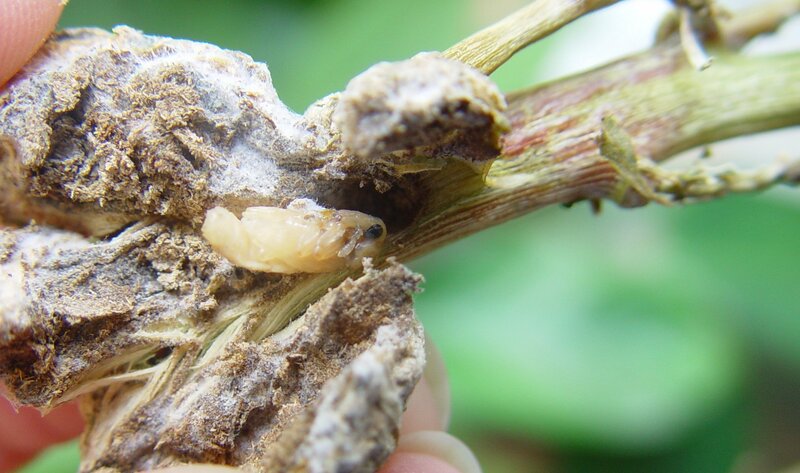 Adult weevils feed on leaves, but the larvae (grubs) are more damaging because they bore into roots and stems, causing rotting and potentially lodging and predisposition to diseases. 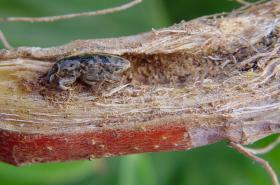 Stem-boring weevils such as the pigweed weevil (Hypolixus haerens) are the most damaging causing plants to wither and lodge. The adult weevil lays its eggs in branch crotches, and the larvae bore through stems to the root collar hollowing the stems. 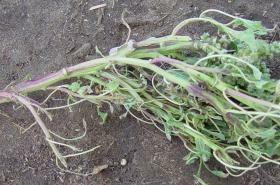 Feeding by larvae results in stems that are more susceptible to wind breakage, thus increasing crop losses. The larvae pupate in the stem. 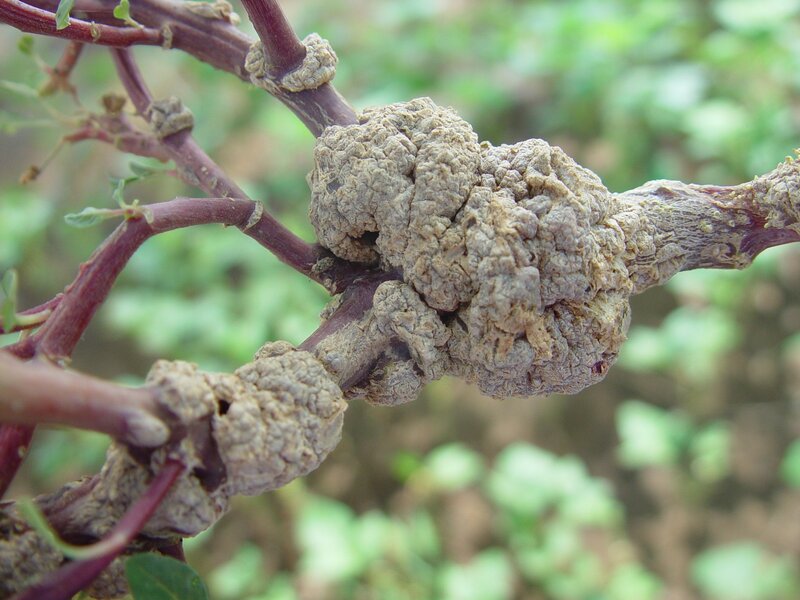 In South Africa, attack by this weevil has been associated with extensive tissue discolouration, decay and cankers in branches, stems, and root collars of Amaranthus hybridus. This weevil has been found to be associated with fungi (mainly Fusarium spp) that cause tissue decay and a canker disease (Blodgett et al., 2004). Uproot and destroy attacked plants to reduce number of weevils and prevent damage to healthy plants. 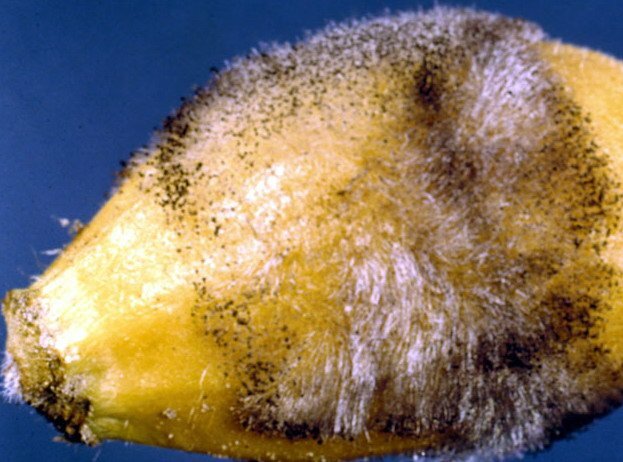 Bugs can cause severe damage to flowering head and seeds, and may be particularly damaging to grain amaranth when present in large numbers during the critical seed fill stage. They are usually of minor importance in vegetable amaranth, and no control measures are needed. 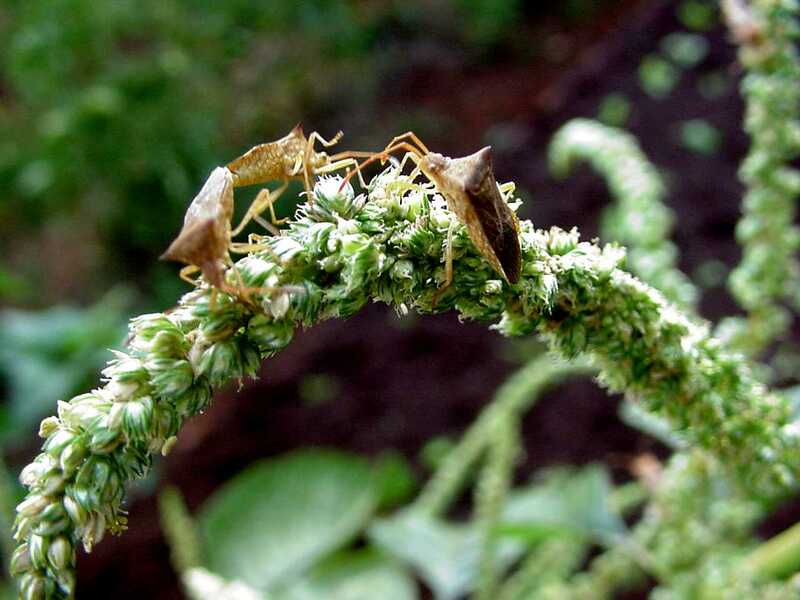 Bugs are usually of minor importance in vegetable amaranth, and no control measures are needed. Damping-off caused by Pythium may occur when the seed-bed is too wet. Wet rot (also called Choanephora rot or blight) caused by Choanephora cucurbitarum and some other fungal diseases (Alternaria, Cercospora, Phoma, Rhizoctonia) may cause problems. The crop is more susceptible to these diseases under humid conditions, high plant density and high doses of nitrogen. Plant parasitic nematodes are reported to occur but are not a serious problem.See detailled information below. The disease is caused by Pythium aphanidermatum, Rhizoctonia solani and Aphanomyces sp. Seeds may rot in the soil before emergence (pre-emergence damping-off) or seedlings may exhibit stem canker above the soil line and/or root necrosis. 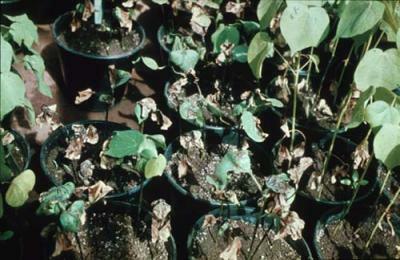 Affected seedlings eventually wilt (post-emergence damping-off). The disease is favoured by high soil water content and low soil temperatures. Also dense planting without sufficient aeration enhances disease development. 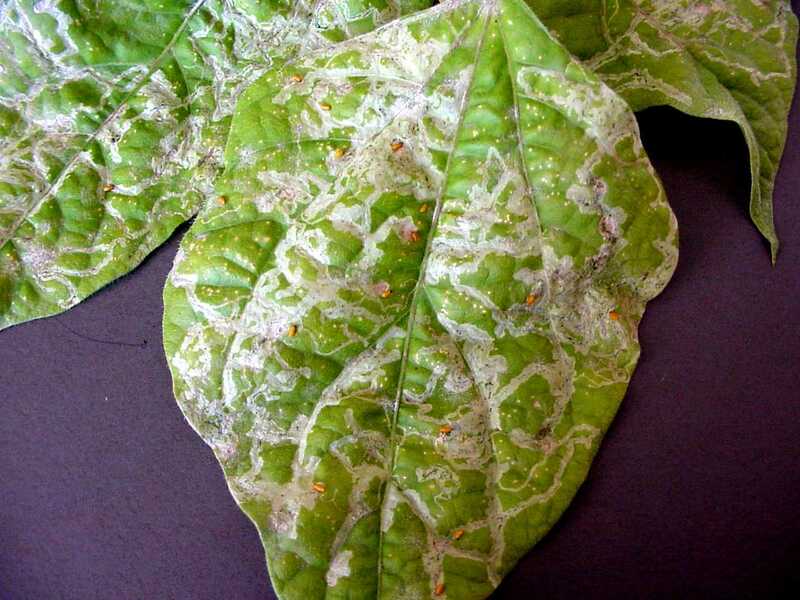 Choanephora blight (also called Choanephora rot) is caused by fungus Choanephora cucurbitarium. It causes wet rot of stems and leaves. Affected plant parts have hairy appearance (silk-like threads) consisting of fungal spores. Infection is predisposed by injuries. During rainy season it can cause heavy defoliation. The disease is spread by air currents and infected seeds. Warm, moist conditions favour disease development. Avoid dense planting to allow sufficient aeration. Weeds compete for light, water, and nutrients, thereby resulting in reduced yield. Thorough land preparation is the first key to effective weed control. Amaranth is small-seeded and slow to germinate - therefore, weed control is essential early in the season. A seedbed free of weed seeds allows amaranth seedlings to get a head start on the weeds and establish a canopy that can shade out emerging weed seedlings. Mulching is recommended to reduce weed competition, soil compaction and erosion; mulching also conserves soil moisture. Be sure the organic mulching materials are free of weed seeds. Mulching is easier to apply if the amaranth crop is transplanted, but can also be used for row-seeded crops after the seedlings reach a height of 10 to 15 cm. NATIONAL RESEARCH COUNCIL Division on Policy and Global Affairs Development, Security, and Cooperation. Stallknecht, G.F. and Schulz-Schaeffer, J.R. (1993). Amaranth rediscovered. p. 211-218. In: J. Janick and J.E. Simon (Eds. ), New crops. Wiley, New York. Katumani Research Centre, KALRO (kalro.katumani@kalro.org; +254 (0) 710 906 600).